"A boy and his hired muscle"
Melkeen is a Wizard with a chip on his shoulder and a lot to prove. He’s hired Sarta, a Northern woman with a pair of deadly blades, to be his bodyguard while he treks all over the known world in search of Arkane magik. The pecking order of the World cannot be ignored, as this unlikely pair well knows. This journey is not intended to end well for either of them, so they must watch for dangers from the unlikeliest of places. Swords and Sigils has not been tagged yet. Help others find Swords and Sigils by tagging it! "This is a fantasy story about a young prodigy and his side-kick (who can kick some serious side). It’s set in your standard fantasy world with all the expected accouterments. Details in the text." 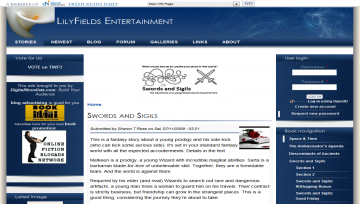 Swords and Sigils has not been recommended yet.